Power3 ratchet blocks provide sailors that race small one-designs with three holding-power options to handle a variety of wind and sea conditions. More choices allow sailors to fine-tune their set-ups in tandem with the purchase that provides the ideal level of power, responsiveness and grip. The patented T2 Ratchamatic is Harken’s newest block to feature the T2 line’s styling and soft-attachment system. The weight of this high-strength block is only a few ounces. This is thanks to composite fiber-reinforced sideplates, aluminum sheave, a lightweight soft-attach, and a minimum of moving parts in the ratcheting mechanism. All T2 blocks are lashed or spliced through the load-bearing center of the block, decreasing the loads on the sideplates and acting as a safety backup for the system. Lashing allows ratchet adjustment close to the deck. Lashing or splicing provides a variety of options for securing the block at exactly the right height to maintain a fair lead. 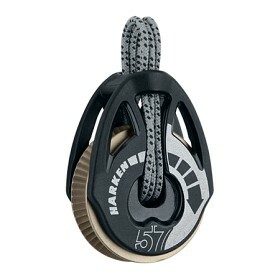 Pressure on the line engages the ratchet mechanism, which switches seamlessly from free-running to ratchet mode. Unloaded main and jib sheets run out freely during mark roundings, and asymmetrical spinnaker sheets free instantly during jibes. T2 Ratchamatic blocks are clearly labeled with high-contrast directional markers for correct reeving and trimming direction. Use for mainsheet and spinnaker systems on beachcats, dinghies, and sportboats. A length of Spectra® line with a polyester cover is included. Spectra is a registered trademark of Honeywell International, Inc.